We are thrilled to offer you the chance to taste a line up of wines from the iconic Chateau Musar. We have the special opportunity to be guided through our tasting by Marc Hochar. This is also a great opportunity to purchase Musar wines. Those attending the tasting will be able to order from the complete list of available Musar wines at a hefty discount. This will be a seated, guided tasting, with finger foods and snacks at the table. Chateau Musar, founded in 1930 in Lebanon, has developed a devoted cult following over its 89 years of producing wine in Ghazir, approximately 30 miles north of Beruit. 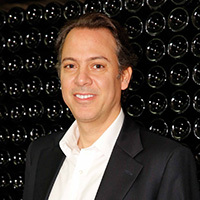 Gaston Hochar founded the winery at the age of twenty and established a reputation of high quality wines and a relationship with the wine industry in Bordeaux. His son Serge eventually studied oenology with Emile Peynaud at the University of Oenology in Bordeaux. In 1959 Serge became Chateau Musar’s winemaker and led the winery to it’s current status as a beloved, convention defying, producer of singular wines. Since Serge’s death in 2014 the operation of the winery has been taken forward by his two sons Marc and Gaston. Chateau Musar is known equally for their non-interventionist wine making style, a philosophy that is at the core of the now fashionable “natural” wine trend, and their perseverance. Serge and his brother Ronald led the winery in continuing to produce and export exceptional and distinctive wines in the middle of the 15 year civil war. We say that we like to sell “wines with stories” none embody that description more than the wines of Chateau Musar. These are excellent wines of place, of individual personalty, that are world class and incredibly age worthy, coming from a family owned winery with a deep and inspiring story. This tasting is a special one we encourage not to miss. You can read an article from Eric Asimov about Chateau Musar and Serge Hochar from a tasting in 2012 HERE. Guided Tasting - Early Mountain, Lightwell Survey, and more!